The Command Communication Center has become more and more accessible to the people. From June 1 last year, we started work with 750 staff. 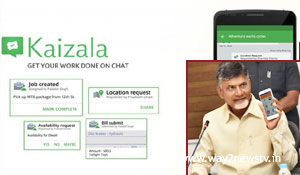 With the launch of the newly launched Kaizala information system, the 'Connect AP CM' launched the app. Is this system available for government functioning and welfare programs and MLAs available? Or ?, a serious problem that you are facing locally, and any other questions in the app. The answer to the people through the app is that only Chandrababu knows the technique. The techniques that have been bleeding from a few days have seen such suspicions. Telugu Desam Party chief and Chief Minister Chandrababu Naidu has been alert to the elections in the next two years. The concept of technology is directly related to the existence of services in the key sectors such as civil supplies, revenue, power, police and medicine associated with life. Recently, 25 government departments have been given a toll-free number of people through the innovative information system that provides direct and indirect information from the public. A team of trusted officers will constantly monitor and take action accordingly. There are daily reviews on this. Babu's original aim is to alert all sections of the information through the Kaizala app, alerting the concerned departments, alerting them to ACBs and surveillance systems, and recalling the details of the concerned ministers' review meetings. Based on the results, Babu plans to prepare people to get closer to the people, party sources say.